The Phillies hand the ball to Joe Blanton tonight at AT&T Park in San Francisco. He'll face one of the best younger pitchers in baseball, Tim Lincecum. I remember when Tim was in the rotation last year and seeing him pitch at Citizen's Bank Park. He puts his whole body into motion on his pitches and has a blazing fastball. Lincecum is 11-3 on the year so far, he may not win 20 games this year, but he is on his way to have yet another great season for the Giants. He is 36-13 on his career at this point, and that's excellent. 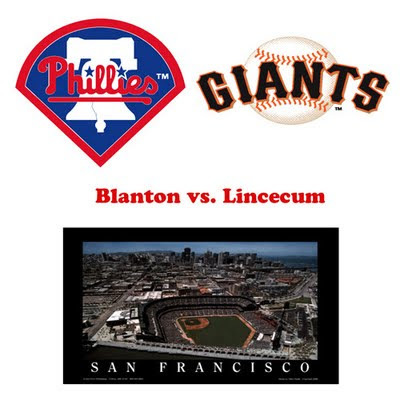 I would have preferred to see the Phillies put Lee up against Lincecum instead of pitching him last night, but I guess the team didn't want to put too much pressure on him in his first appearance in a Phillies uniform. Big Joe will go for the Phillies, he is 7-4 so far on the year and has been pitching well, so there's no reason to think he won't go out there and pick up a win for the Phils tonight. Game time is 9:05 pm tonight, with the broadcast being on CSN. I like the post games that MyPhl17 have been doing, it's a lot less 'stuffy' than the production of the Comcast CSN post game shows and they usually do the show from Chickie and Pete's.